This little fella peeking out from the reeds above, the Least Bittern, is often described as ‘reclusive, ‘solitary’ and ‘elusive’. 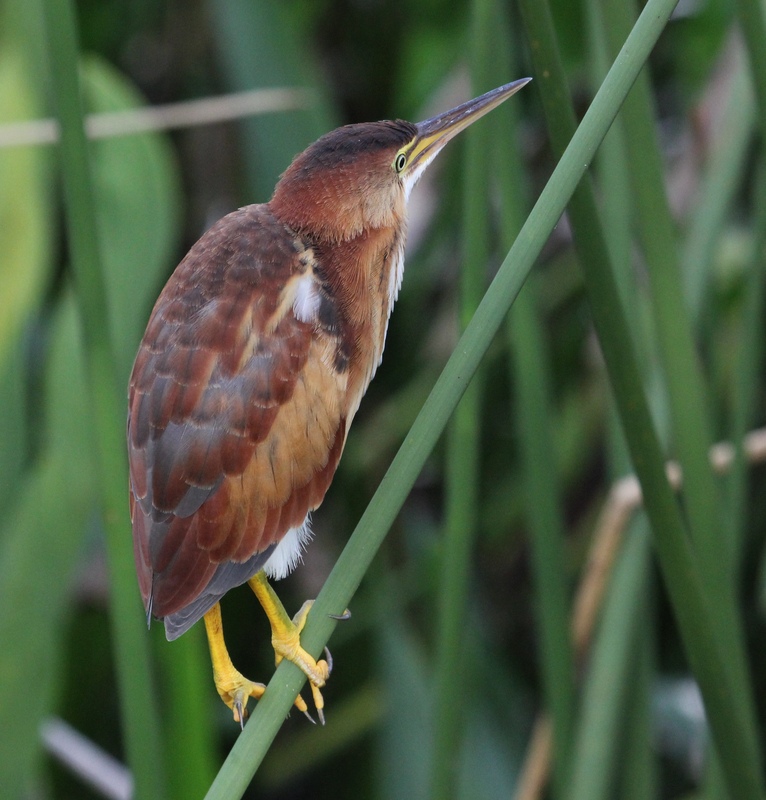 He is the smallest of our Herons (11-14″), and quite a common permanent resident of Florida. But, the Least Bittern is often hard to find – and difficult to see clearly once you do catch a glimpse of him. 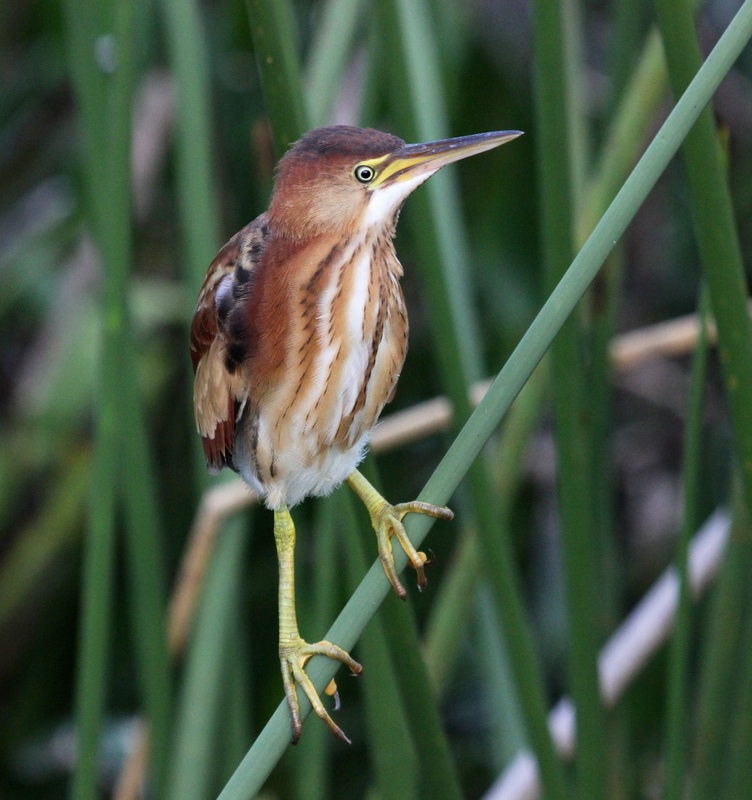 The Smithsonian Handbook, Birds of Florida (2002) calls the Least Bittern “the shy secretive denizen of the marsh. Seldom seen or heard” (p.65). 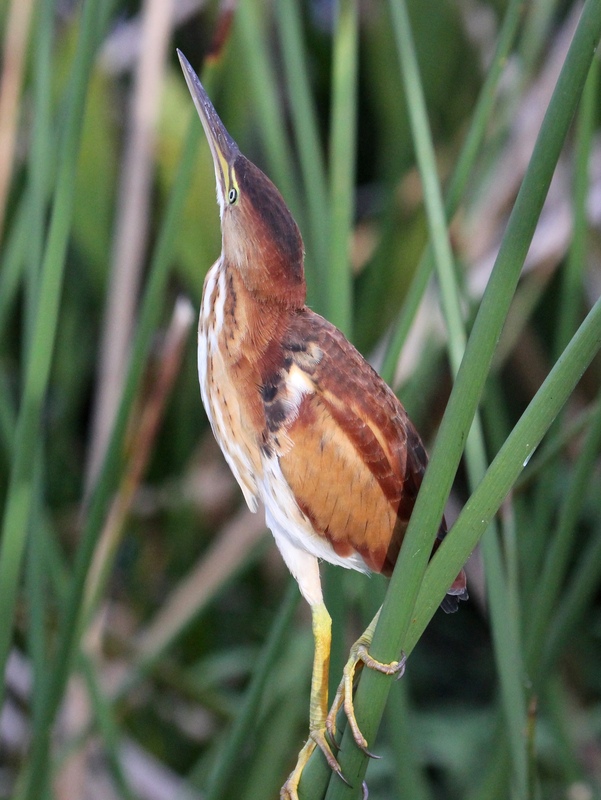 When they do appear, they are most likely to be noticed at the edge of an area of dense reeds, close to open water. So imagine my delight when I came across this guy. He was busily climbing in and out of the reeds, quiet as can be, often standing right out in the open, only 5-6 feet away from me! I was lucky enough to be the only human anywhere around, and got the chance to spend about 15 minutes alone, just admiring this delicate little creature. 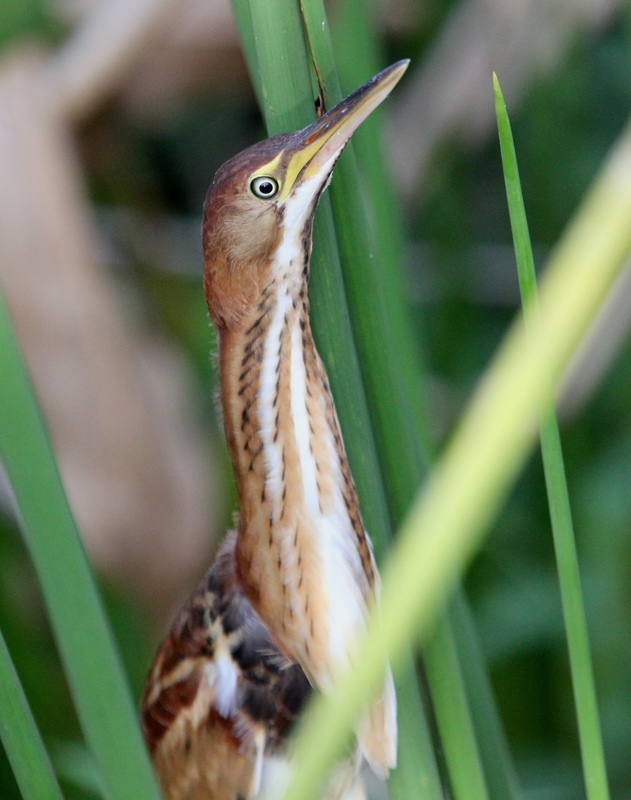 David Sibley calls the Least Bittern “uncommon and very inconspicuous” (p.107). This one dared to be visible, but appeared to be acutely aware of his surroundings. At the sound of a larger bird overhead, he suddenly looked up, on high alert . . . . . . extending his neck in alarm posture, seemingly to get a better view of whatever might be in his territory. The Least Bittern “is reluctant to fly, relying on its cryptic color pattern to escape detection.” (Audubon Field Guide to Birds, Eastern Region, p. 366-7). They fly somewhat awkwardly, and spend most of their time hiding in dense vegetation. What a special time I had – so fortunate to experience these moments with this delightful bird! 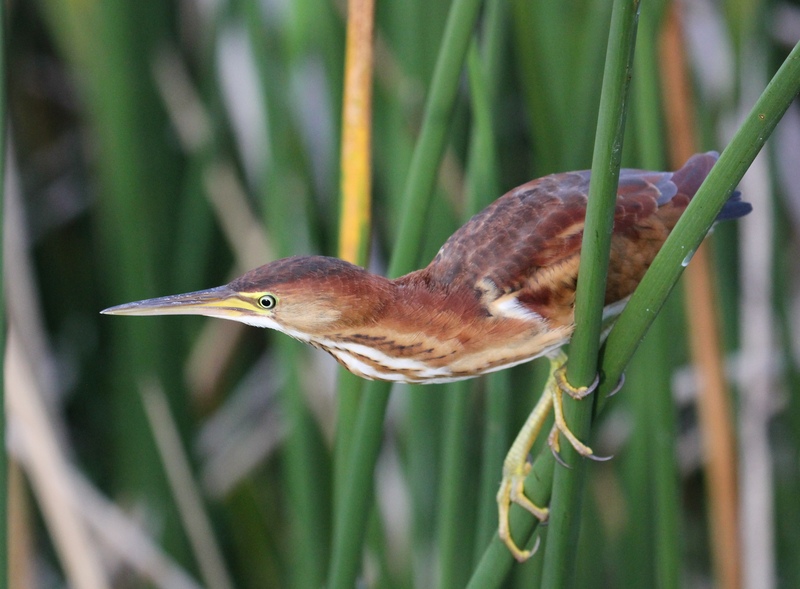 To find out more about the Least Bittern, see these pages at All About Birds and on the Audubon website. 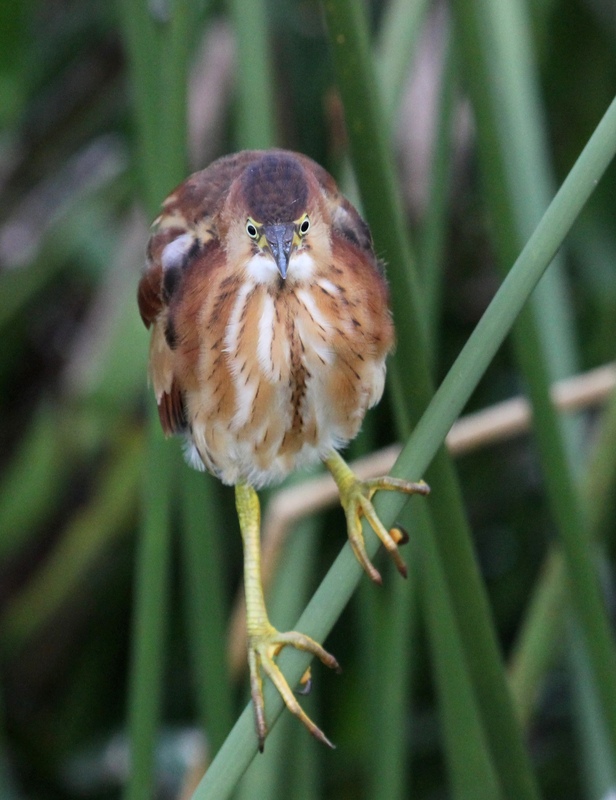 This entry was posted in Birds, Marsh/Wetlands and tagged Least Bittern. Bookmark the permalink. What a wonderful experience! I saw two Least Bitterns at a coastal marsh this past weekend, an adult and a juvenile. They weren’t nearly as close as your Bitterns, but with binoculars I had quite the view. 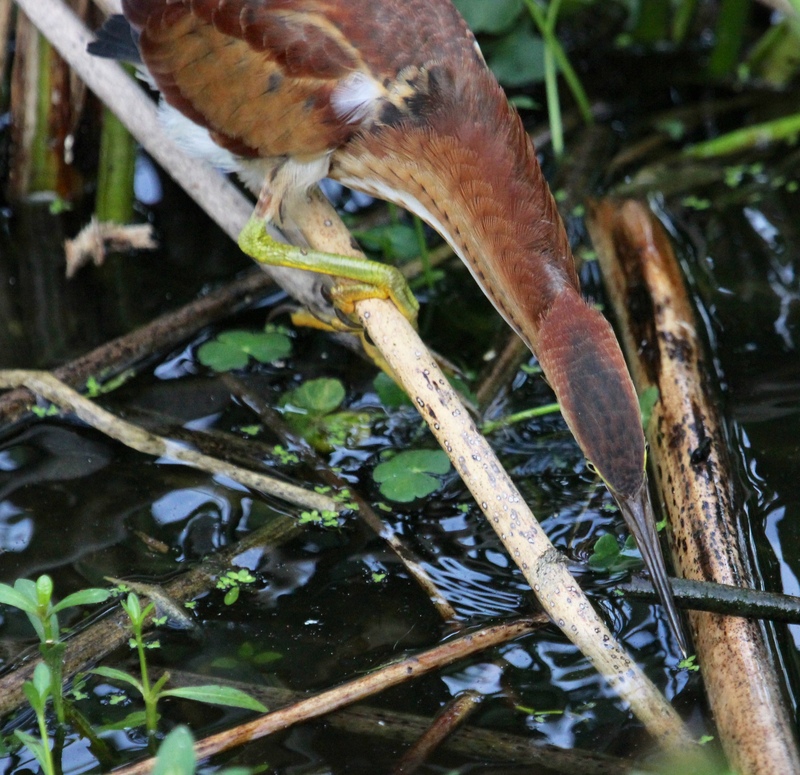 So exciting to see such a stunning and introverted bird so well!! Great photos, too, by the way! Smile. How wonderful that you got to see them together, Judy! I went to the same spot this morning already at 6:30, but only saw a fleeting glance of one flying off to hide deep in some branches. Thanks so much for your comments and your visit – have a beautiful day! You also! We just have to keep going back to those spots. Sooner or later, they’ll pop out of the reeds for awhile and grace us with another visit. Although I see them from time to time, I’ve never been close enough, or had them stay long enough, to take so many pictures. Thanks so much for sharing the delight in the experience with me, Jet. Wonerful pics, and how great to get that close to a Bittern, they have been so elusive to me! They certainly have the well-deserved reputation of being hidden and elusive, AB. I really do consider myself very lucky this time! Always great to hear from you. I can see why people make Life Lists … Although I’ve seen our Least Bitterns before, I’m continually learning about new birds and having new experiences with the ones I already know about! Thanks for stopping by HJ. You were very lucky, here they are shy and stay in the reeds. I love how you captured the photos, the bittern has a lot of personality. Yes, this was very expressive bird, so fun to watch! I must say, they are more often hiding in the reeds here, too – this was such a lucky moment for me to see him out in the open for so long. Maybe he wanted to be seen by YOU! What a LOVELY thought ☀️~ thanks, Yaffa! I hope it’s working now, Amy. And thanks so much for your visit and for the beautiful images and stories you always share on your blog! A super adventure. Thanks for sharing it with us. Happy to have you come along!